I know for most of you 5km won't seem far but for me I was just really chuffed to get myself fitter, complete it in a good time and at the same time raise money for an amazing charity. After I finished in under my goal time with crossing the line in 28minutes - it got me thinking.... a couple of years ago I would have never been able to achieve something like this and I am really proud of how much I have changed myself for the better concerning my weight and health. So with this thought I decided that I should do a quick blog post on how I lost weight and how I have became a healthier and happier person. Yup. I indeed weighed alot more. How much you ask? About 2 stone more. And you may all be thinking but your fine now? you wear size 10? why do you still want to talk about it? I do still get people that I know asking me for advice and 'how did you do it?' and to be honest it is something that I did all by myself no Atkins or Marjorie Dawes involved and that is something I am still very proud of. Before I start I just want to state that I am all for people who want to loose weight but these things always need to be done in a healthy, moderate way. Starving yourself does not work and my response to every single person who asked me "What diet did you do?" was ... 'The eat less and exercise more diet'. I ate less crap (because I was a junk food whore) and I made myself alot more active (because I was a lazy couch potato) these were simple, easy and basic steps AND they worked. It was 2011 and over the past year or so I had slowly but surely gained of good few unflattering pounds. This was the first time in my entire life that I had ever been bigger than your average size 10/12 or "overweight" and although my friends told me I looked no different I felt and knew that in reality, I did. I think first truly believed I was overweight when one rainy afternoon I decided to play on my wii fit and after my first little 'test' my cute little person who I'd grown to love suddenly expanded. I am deadly serious. It full on went plop with a sound effect and became a chubbier little mii person who I immediately felt sorry for. (Lets just say the wii and I then fell out and I was determined to prove it's judgmental scales wrong). This, along with the fact I had just booked a trip around America for 6 weeks for March 2012, with my best friend, was the firm kick up the backside I needed to start my weight loss journey. It was October 2nd 2011 (I remember this as it was a friends birthday) and something in me snapped and right there, right then I was on a diet. I'd said this countless times before... "I'm on diet"..."I'm determined" but they all seemed to end on a drunk Saturday night and a hungover Sunday morning. But this time it was different, I had a goal. I wanted to be confident America and be able to enjoy myself to the full. I wanted to be able to go to the water parks in Florida, go to the beach in LA, party in Vegas and not have to think about what I could wear to cover up and how I could avoid these intense public situations. At one point I was actually thinking about wearing leggings to Typhoon Lagoon - how is that even a normal thought? And even though I still have hang-ups about myself (that is just something in me that will never change) I went and I had done it and felt 100000% more confident and happy within myself. Along with wanting my confidence and self-esteem back (which at this time were total rock bottom) America was the number 1 reason for me to loose weight. But there were also a number of other things constantly on my mind and the answer for all of them always pointed towards me loosing weight and become a healthier and therefore becoming a happier person. I would get anxiety a lot back then and really really badly and I am certain that was to do with my diet and the poor poor state it was in. My fitness was also horrific which for me was just awful. I'd always been a sporty kid/teenager and too be out of breath walking to work was just not right. Fashion also played a huge part. At the time I was working in fashion retail and so much of the stock that came in I loved but I just couldn't wear it because of my size and shape. I'm not say I was really really huge, I wasn't 47 stone and stuck in bed or anything, but knowing my body and how I felt, I just wasn't right. Anyway I digress, it is October 2011 and I decide to get the "Myfitnesspal" app for my iPhone, which can I just say was absolutely brilliant for me. You can type in what you eat and how much you exercise and it calculates your calorie intake and loads more. If you are looking for something to keep track and help control your diet and find out more about what you eating - this will help. I knew the main things I wanted to cut out. White bread, pasta, cheese, pizza, crisps and sweet treats (mainly my top weakness - chocolate.) These are things that I knew had to go. I'm sure it's different for everyone but these were my downfall. Drinks, surprisingly, weren't actually a problem for me. I only drink water and green tea anyway (unless I'm going out, in which case it's a vodka & lemonade) so I just made sure I was constantly drinking them. Water is one of the best thing for weight loss, it has so many amazing benefits and makes you feel so much better aswell, if I could give one top tip for being healthy and loosing weight it's drink more water. Rather than bore you with what I used to eat daily I will list below food which became the main staples in my diet. Vegetables/Salad - Broccoli, Carrots, Peas, Spinach, Sweetcorn,Lettuce, Cucumber. Of course I'd still have treats now and again and most weeks I would have 1 day where I could have whatever dinner I wanted, which normally ended up being my favourite meal - my mum's macaroni cheese. After just couple of weeks and a few pounds I was feeling so much better abut myself and as soon as you start to see that number on the scales going down the more motivated you feel about what you are doing. The last thing you want to do then give up and ruin all the hard work you've done. Another thing which keeps you motivated is comments from other people, sometimes people worry about saying "ooo you look like you've lost weight" as they don't want to offend the person, but I loved it. The fact that other people were noticing these little changes just gave me that extra boost to keep going with it all. So for the next 2 months I worked super hard and kept it up and amazingly by mid-December I had reached my goal weight, I had lost 28lbs and I had bought a size 10 dress for the first time in years. This was the happiest I had been in a long time and finally felt like myself again and since then I vowed to try and keep myself healthy. Yeah I still eat junk food (who doesn't) but I like to think that I am more sensible with my eating now and still keep myself really active. If you want to set a goal, no matter how small, do it. Take little steps each day and with determination and motivation you will always make it to what you want. Sorry if this has been a very long and rambley post and if you did/n't like it please let me know in the comments and give some feedback as too why. Well done! you must be so proud of yourself. I started to loose weight a few months ago but fell of the wagon when my uni finals came looming. Your post has given me motivation to try again and be successful this time round! Great post! 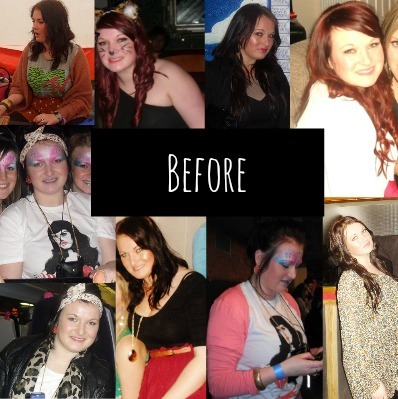 I've had a similar experince in loosing 5 stone (I was REALLY overweight) and am now a size 10! I really support the message that starving is not the answer, it wasn't for me. Also my advice is always aim to loose weight slowly and steadily and of course, treats are a must! This is such a motivational, inspirational and REAL post. I love how you stress that you did it through eating healthily and exercising. You're so right about drinking more water and I love how you still allowed yourself to have your favourite meal once a week. Congrats on your progress and for staying on track ever since! Thank you for sharing this post with me hun, I love it. I am trying to improve my body atm, and although I know what I need to do, I am struggling to stay consistent. But you've made me realise that I now have a clear goal, my holiday is in 5 weeks, so I need to buckle down and just do it! Wow! Well done you're such a perfect advocate for the healthy eating and exercise diet, no fads! 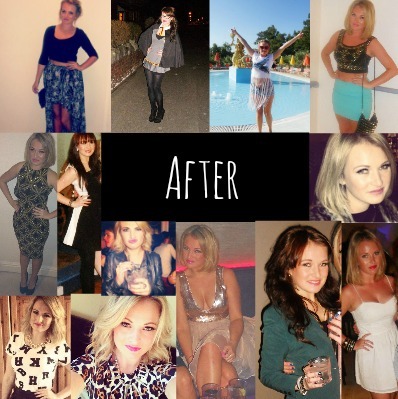 It's all about a lifestyle change and i'm so glad you express that in this post. You look so amazing now, and it just shows it's all about mentally proving to yourself that you can be who you want to be, but there is no quick fix! This post is brilliant, you've done so well! Would never recognise you in the first set of the photos. Glad you did it the healthy way and have been able to keep it up. Yes you can!!! Keep me updated with your progress gorgeous! Hey thanks for Doing this post. I've just started on the sand weight loss journey myself and am blogging about it and this is a wonderful inspiration! Great post! I'm in the process of trying to get fit and lose a bit of weight because I notice I can slowly gained a bit since starting my office job 3 years ago. This is so inspiring. I'm trying to lose three stone at the moment and trying to eat better to do that. Congratulations. Oh my gosh you're a completely different person. You look fab! Blonde is definitely your colour also! I know i'm not big, but I have noticed a difference in me and i'm the same, I don't feel right so I should probably cut out pizza and chocolate too! Wow! Awesome job :) my motivation lasts all of about a week.... :P I also think its really hard when you hit your goal weight and don't want to lose or gain!